Thanks to Tru Bahamian Food Tours, I was able to experience Nassau, Bahamas in 6 delicious bites. And what delicious bites they were! While on the walking tour, I also learned more about Nassau’s history and culture. Follow along with me as I take you on a food and mini history tour of Nassau as I experienced it. In operation for almost 30 years, this 3 generation Bahamian, woman-owned restaurant had a welcoming and authentic atmosphere. On the menu was conch fritters, steamed chicken, peas and rice (different than rice & peas native to other Caribbean countries), plantains, and cole slaw. I finished off my meal with a cold glass of Bahamian lime Switcha. Since this was the start of the tour, I was excited about what was in store for the rest of the day. Not only is there a 5-star hotel and restaurant in Graycliff, but it’s home to a cigar factory, chocolatier, and the third largest privately owned wine collection in the world. It was like an amusement park for adults! First, I enjoyed a local beer tasting from the Bahamas Brewery and Beverage Company called SANDS. Sands is a pale lager, light bodied and designed to quench the Bahamian thirst within such a hot, humid climate. It’s made with natural spring water from the island of Grand Bahama (location of the brewery) and was launched in 2007 to rival the Heineken-owned “Kalik” brand first introduced for the Bahamas market in 1988. Second, we stopped by to see Graycliff cigars being handmade. I’m not a smoker, but it was an interesting experience nonetheless. My third stop in Graycliff was the Graycliff Chocolatier. The chocolatier is operated by an award-winning chocolate maker and pastry chef, Erika Dupree Davis, who was a contestant on Top Chef Desserts. I toured the facility to see exactly how chocolate is made starting from the very beginning with a cacao bean. Artfully designed bon bons are handmade in-house that feature various indigenous Bahamian ingredients like guava, key lime, goat pepper and mango. I sampled the key lime pie white chocolate, dark chocolate salted caramel, and chocolate bacon bon bons. HEAVEN. 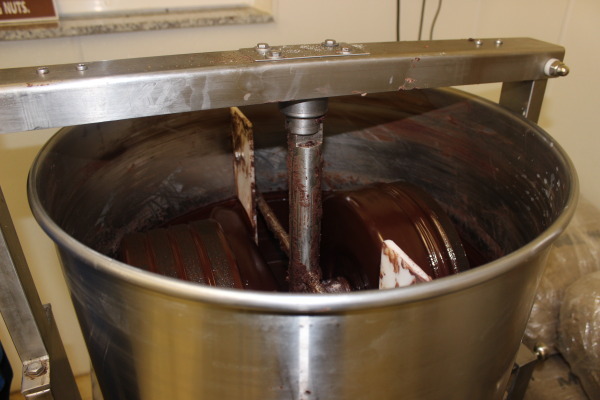 The chocolatier also welcomes tour groups visiting the island to create their own chocolate goodies. The wine cellar tour was also quite the experience, but that deserves its own post :). Van Breugel’s is a charming Euro bistro and bar in the heart of Old Nassau with a private dining room and a menu that features eclectic fusion dishes. The owner is a trained Master Chef and has flair for taking traditional Bahamian dishes and combining them with Euro and Thai flavors after spending time throughout Europe and in Thailand. I tried the most popular dish on their menu – coconut curry conch chowder – and it may have been the best chowder I’ve ever had. We stopped by a local tea merchant specializing in herbal bush teas, jams, spices and exotic pepper sauces sourced only from Bahamian artisans throughout The Bahamian islands. I tried iced Simply Orange fruit tea with local orange peel, orange oils, hibiscus petals and apples. I also tasted a variety of Bahamian hot sauces, dried spices and their famous guava jam, which was so good that I ended up bringing some home! Athena Cafe is the island’s oldest Greek restaurant and a downtown Nassau Landmark. Since 1995, Athena Cafe has served classic Greek dishes including Greek salad and gyros from its family run kitchen. I tasted authentic Greek salad and fresh pita bread, while discussing the importance of Greeks in Nassau. Greeks first landed in Nassau in the 1860’s to engage in the sponging trade. This was an interesting history tidbit that I don’t think many people know. This is Nassau’s premiere rum cake bake shop, serving 6 flavors of rum cake baked daily using 5 year aged Rum (est. 2005). Of course I had to sample the goods. I tried the golden original rum cake, which was so moist and delicious that I knew I wouldn’t be able to live with myself if I didn’t bring any home. Pompey Museum of Slavery and Emancipation. This museum is named after heralded Bahamian Slave Pompey who in the 1800’s, led a significant slave revolt on the island of Exuma. Government House. Official Residence of the Bahamas Governor General – the country’s representative to Queen Elizabeth the 2nd of Great Britain (the Monarch of the Bahamas). Christ Church Cathedral. Built in 1670, it’s the first official place of worship in Nassau. It’s also home to all State funerals. The tour provided a great overview of Nassau history and heritage, which was an added bonus on top of the amazing food tour. I’ve been to Nassau many times, but I can honestly say this was my favorite visit and that is partly because of Tru Bahamian’s Food Tour. I felt so connected to the local culture. If you’re ever in Nassau, please contact Tru Bahamian Food Tours to schedule a visit. I promise you won’t be disappointed. And tell them I sent you! *While this post is sponsored by Bahamas Ministry of Tourism, all opinions expressed are my own.